There is so much talk about God’s mercy these days and yet many people have the wrong idea about it. To put it simply, the purpose of God’s mercy is to call the sinner to repentance, that is, to have the sinner turn away from his sins, beg God’s forgiveness, and amend his life. If the sinner refuses to repent, then he abuses God’s mercy and can consequently expect God’s punishment upon him. Without repentance, God cannot forgive the sinner. If the sinner persists in his sin and dies in that state (i.e., with the guilt of mortal sin), he will be condemned to hell forever. Let us read and meditate on the words of St. Alphonsus Liguori, Doctor the Church and moral theologian par excellence, on this matter. This meditation was taken from his book called “The Way of Salvation and of Perfection”. Endorsing books written by modernist Cardinals is a forbidden Index all by it self. It is these very cardinals who promote the damaging Vatican II new-religion that ultimately DESTROYS the very family they say they want to “save”. The aim, like Vatican II, is to rewrite history to remain selfish without being too selfish. Like telling a fish to drink some water but not too much water. 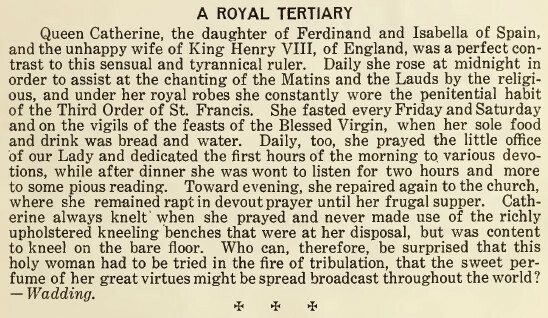 This article was taken from the February 1916 issue of the Franciscan Herald. 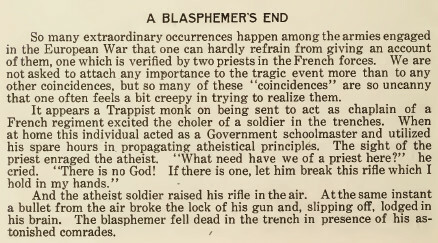 The article was taken from the February 1916 issue of the Franciscan Herald. Father gives an excellent sermon on the need to Watch and Pray, for example, the Year of Mercy is the gesture of a fox! 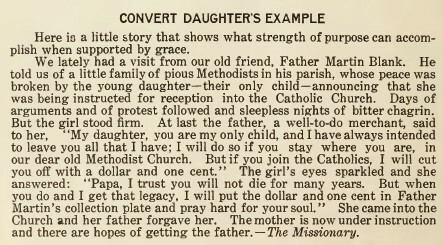 This article was taken from the October 1915 issue of the Franciscan Herald. If an angel from Heaven speaks to three young children in this manner, what would he have to say to us? What does God expect from us? Are we doing everything we can to fight in this battle as Soldiers of Christ in the Army of Our Lady? In 1634, Our Lady of Good Success appeared to Mother Mariana de Jesus Torres, a Conceptionist nun living in Quito, Ecuador. The nun was given prophecies about the future and especially about the 20th century. With respect to point 4) above, read the shocking front-page article from the Toronto Star September 2, 2015 issue where an Ontario school board reports on how they will be corrupting the innocence of school children (https://www.thestar.com/yourtoronto/education/2015/09/02/peel-board-wont-exempt-kids-from-learning-about-gay-families-gender-issues.html). Our Lady foretold that in the 20th century the situation in the Church and in the world will be so bad that “You would die of sorrow to see all that I have revealed to you here take place” (p 214). Then, when the situation will be at its worst, when “evil will seem triumphant … This, then, will mark the arrival of my hour, when I, in a marvellous way, will dethrone the proud and cursed Satan, trampling him under my feet and fettering him in the infernal abyss. Thus the Church and Country [Ecuador] will finally be free of his tyranny” (p 214). Now is the time to pray and work toward the restoration of the Church: the victory will be won – may we be part of it! Let us pray that God may “quickly bring to an end those ominous times, sending to this Church the Prelate who will restore the spirit of its priests (emphasis added, p 213)”. This will bring about a full restoration of the Catholic Church and the Reign of Christ the King. However, we are living through the devastation prior to the restoration. We must not falter. This is not the time to adopt politically correct language or to have an exaggerated human respect for people in positions of power, particularly in the clergy. We have to take the lesson of Vatican II seriously and not repeat it. This lesson demonstrates what happens when bishops cease to teach, and, when under the pretext of false obedience and exaggerated authority, the laity does not stand up for the Truth – instead Truth becomes subject to expediency and cowardice. Listen to Fr Gregorius Hesse’s talks about Papal fallibility and you will be surprised with what candor and directness Father comments on the actions taken by various popes and the militancy Catholics used to defend their Faith. His bluntness gives courage to his audience! We must adopt a similar attitude! So, with “childlike simplicity” (p 209), we have to be direct and honest. We have to focus on spreading the Truth and working for the Kingship of Christ. We cannot have an exaggerated respect for the clergy if they are not doing their jobs – we must point out the errors as did the Catholics of old. Contrast this with Bishop Williamson, whose duty it is as a bishop to teach and to defend Doctrine. In his EC 420 August 1, 2015 “Authority Limping”, he states: “At present I am more and more disinclined to impose even a true viewpoint on anybody, because souls are now so confused that the least imposition is liable to increase rather than decrease that confusion.” But if a bishop does not use his office to “decrease confusion“, who will? As Catholics, it is our duty to oppose error and confusion. This should not be exercised by emotional comments made privately behind people’s backs or by specious arguments on blog postings, but rather by sober and reasoned arguments to people who are in a position to make changes.